The Leveling Caster is a combination leveling foot and caster to allow cabinet designers to maximize the stability of cabinets both while rolling and in the final installation. Cabinet designers face conflicting needs, (1) to provide leveling feet as widely spaced as possible, and (2) to provide casters as widely spaced as possible for stability while rolling the cabinet to a new location. Using existing hardware, the casters and the leveling feet compete for space at the corners of the cabinet, shown below where red indicates pressure points. If the casters are mounted in the far corners, the leveling feet are too closely spaced and the cabinet is not stable in the final installation. If the leveling feet are mounted in the far corners, the casters are too narrowly spaced, making the cabinet unstable while being rolled into positon. The Leveling Caster is bolted to the floor in a cabinet after a hole is drilled to clear the threaded leveling foot. The cabinet is rolled into position, and the foot is screwed down until the weight is transferred from the wheels to the foot, and to adjust for an uneven floor. 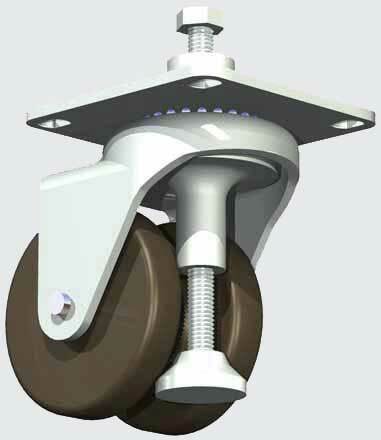 The leveling foot and threaded shaft are tucked between the dual wheels of the caster. The foot wheels of the caster so nearly occupy the same space that the cabinet is as stable as possible in both the rolling and stationary modes. This is a technology announcement and license offer, not a product being offered for sale to end users. Manufacturing licenses are available and HinesLab seeks a licensee. Hardware manufacturers, please contact Steve Hines by email, or at 818-507-5812.